I've been pretty busy with several commissions as of late. First up is a full double-sided board. My client wanted a 3'x3' Malifaux board. On one side is a "cobblestone" texture and the other is generic dark earth with grass. I just finished the forest pieces. They consist of several oddly shaped areas that are between 3" and 6" in diameter. The nice thing about this design is they can be pieced together to create a larger feature if need be. Also the odd shapes make it slightly more difficult to judge distances. 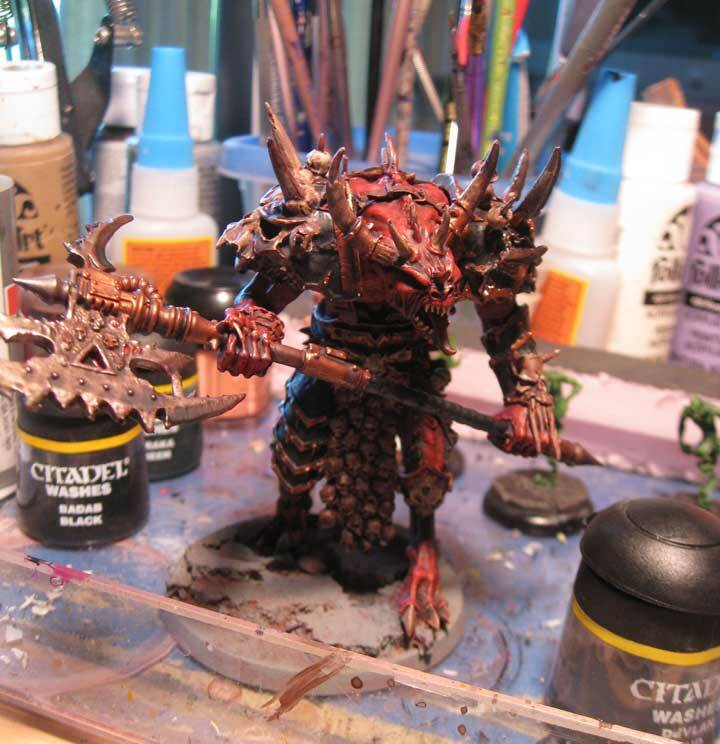 Also on my painting table is the Forgeworld Daemon Prince & Herald. This is a beautiful kit, but like anything that comes from Forgeworld, tons of clean up and tiny pieces to glue and pin. This thing is such a pain, most of the teeth on the skulls are separate pieces. And as with all Forgeworld stuff, your directions consist of a bad photo that obscures the most relevant details. These kits are definitely for experienced modelers. I've assembled both the prince and the herald, as well as primed and base-coated both models. Since the clinet for this job just wants tabletop quality, I've started the process slightly differently than I usually do. For this project I've taken the base colors and applied them to all the relevant areas. So for the price, that's red for the skin, ivory for the skulls, brass and silver for the metal bits, black for the armor, and brown for the leather. Ofter this has dried, I use GW Devlan Mud to coat the entire piece. After it has finished drying, all the necessary shading has been accomplished. At this point all I have left to do is to go in a pick out the highlights. 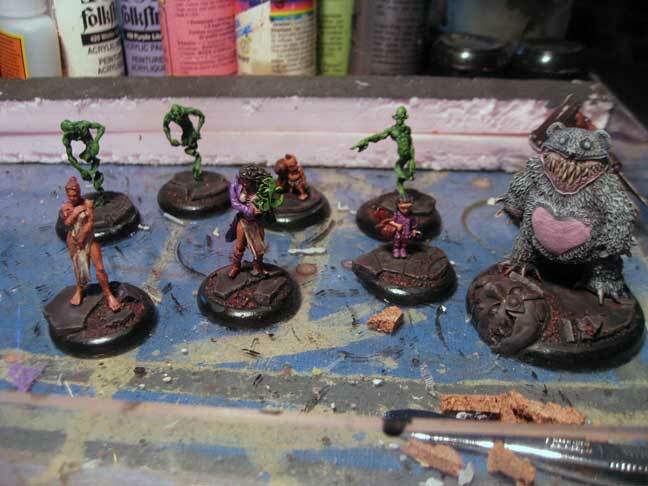 I'm also working on a Pandora crew for Malifaux. This consists of the Legion of Sorrows box set, Teddy, and the Doppleganger. They are based on Dragonforge Designs bases. I've basically only had time to block in the base colors and do some washes. Again the GW wash is pretty amazing.